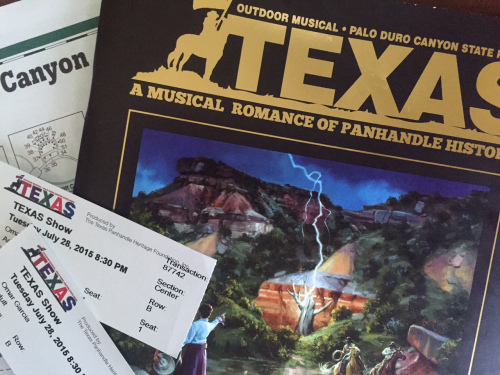 If you live in Texas, you should add Palo Duro Canyon State Park to your list of must-see places in the Lone Star State — not only to enjoy the magnificent beauty of the canyon, but to see the outdoor musical drama “Texas.” This musical romance of Panhandle history will fill you with Texas pride. Now in its 51st season, “Texas” is even better than I remember when I first saw it in its 5th season. 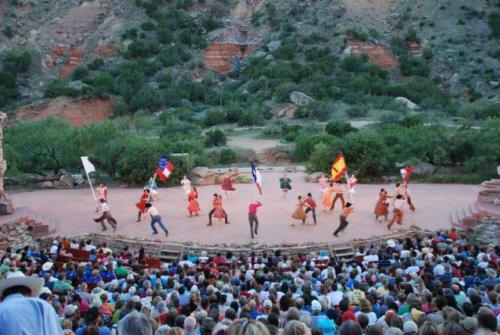 This musical drama, set in an outdoor amphitheater dwarfed by the thousand-foot walls of Palo Duro Canyon, was born in the heart of Margaret Harper. After reading an article in Reader’s Digest about a playwright named Paul Green who specialized in telling the history of a region in magnificent outdoor settings, Harper wrote to Green about the beauty of the Palo Duro Canyon. The rest is history. The musical is a high-energy production filled with all of the things that make a story interesting, including conflict and romance. From the start, you are drawn into the story by a lone rider carrying a huge Texas flag, riding at full gallop along the edge of the canyon. And then it begins, the dancing and singing and the unfolding story of how the Panhandle was settled. One interesting side-note is that Benny Tahmahkera, the actor who plays Quanah Parker, the last Chief of the Comanches, is an actual descendent of Quanah Parker. When my wife Cheryl and I sat through a performance last summer, at one point the wind picked up and we could smell the coming of rain. It’s happened before in this outdoor setting. As the nervous audience looked at the stage and at the dark clouds overhead, the actors on stage were lamenting a West Texas drought that threatened their crops. And then, the first drops of actual rain fell from the sky at the exact moment that Calvin Armstrong, a young homesteader, received word that it was raining and the drought was over. You can’t plan stuff like that! There is so much more to tell about this beautiful story. So, plan now to see it this year. The new season starts in June and ends in mid-August with performances every day of the week except Mondays. Visit the Texas Show website to book your tickets. And, take a few extra bucks with you and enjoy a heaping plate of grub at the Chuck Wagon Bar-B-Que. Regardless of whether you are from Texas, you’ll enjoy this family friendly show with a cool ending you’ll have to see for yourself! This entry was posted in Road Trips, Texas State Parks and tagged Palo Duro Canyon, Texas Show. Bookmark the permalink.